With the arrival of the Nightfall patch to Forsaken World, the Path of Vice or Virtue was opened for characters who complete the mainline quest. 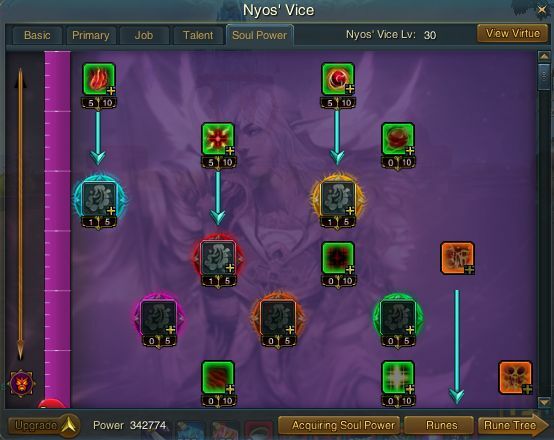 With the Vice/Virtue system, players are scrambling to maximize their daily soul power to level up and unlock their Vice/Virtue trees. 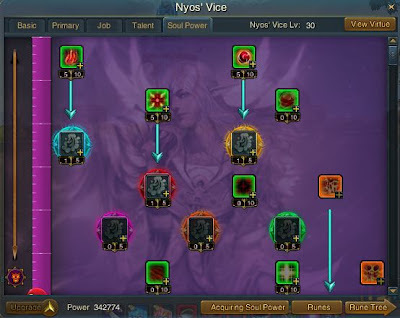 This guide covers the quests and actions that will give a decent to excellent amount of soul power to help you level your Nyos or Dyos paths. 2. Defend Dusk Town hourly instance - score a quick hit of soul power and get a rune or two while you're at it. 3. Dragon Orders and Extermination Orders - probably the fastest way to gain soul power but you're limited to 7 Dragon Orders and 15 Extermination Orders a day. Fastest in a group. However, you can actually do a total of 30 Extermination Orders a day (15 from your level and 15 from the level set below you). For example, if you're level 80, you can do 15 Goblin Henchmen Extermination Orders and 15 Dervish Extermination Orders. 4. Nightfall Daily Quests (soul power for level 80 only) - accrues at the rate of one a day, can store up to 3 quest charges. 9000 soul power at level 80 (lower levels don't get soul power). For each charge you can choose to do one of the following: Run Boy Run, Nightfall Secrets (fastest to do), and Watch Rotation. 5. Wade's Fishing Hole - can take a while to do and only appears at certain times but you get dedication for entering and soul power for doing it. 7. Pet Journeys - corresponding to exp amounts gained. Also there's a new pet battle one using Conscription Scrolls. Check the tooltip for the rewards.